When we look at a picture of a comet, we’re used to seeing a bright, ghost-like streak across the sky. Now, for the first time ever, our eyes are treated to a close-up view, taken from the surface of the infamous “rubber duck” comet 67P/Churyumov-Gerasimenko. Since the momentous touchdown on Wednesday, the ESA’s Philae lander has sent back two snaps of the cosmic snowball, both of which were taken by the Comet Infrared and Visible Analyzer (CIVA) imaging system. 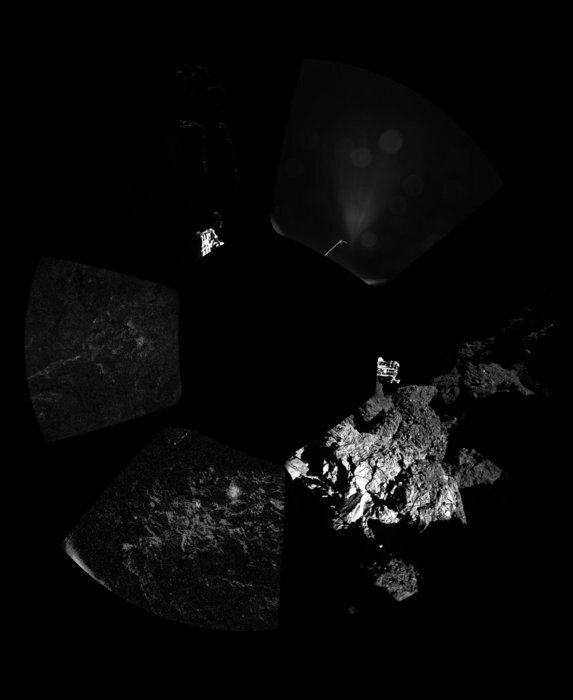 The first (above) shows the comet’s irregular and jagged surface, with one of Philae’s legs photobombing the bottom left corner. 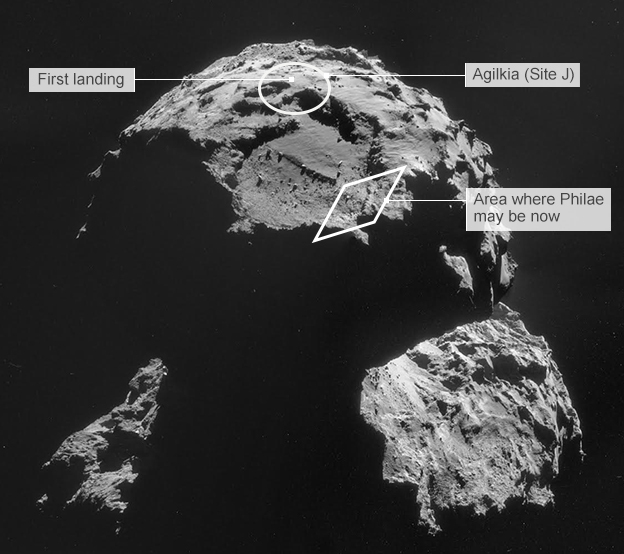 The second (below) is a panoramic image, showing us a 360o view around the final landing site. The images bring with them both good and bad news. The fact that we have received data means that Philae and its mothership, Rosetta, are communicating again after the connection was lost on Thursday. Philae does not send information back to Earth directly, but uses Rosetta as a middleman to relay the signals to us. So, Philae seems to be stable at the moment, which is good. Unfortunately, however, the images sent back have raised concerns. Scientists can’t tell whether the leg that’s poking out in the corner of the image is touching the surface of the comet, but what is clear is that Philae is not on a flat surface and could even be stuck in a pit. “We’re either looking into a ditch or we are against a wall,” said ESA scientist Matt Taylor. Although cheers were exchanged as Philae landed on the comet after a nail-biting seven hour descent, it soon became apparent that the robot’s arrival had not quite gone to plan. Magnetic field data from one of Philae’s onboard instruments revealed that the robot actually made three different landings. After contacting the comet’s surface just three minutes after the expected arrival time, the anchoring harpoons failed to deploy and the probe rebounded. Because the gravity on the comet is extremely weak, it took two hours and one more bounce for the robot to finally settle. The ESA team believes that Philae is now likely somewhere along the edge of the crater pictured below, and may be on its side. This is bad news because the cliff edge is blocking sunlight from reaching the probe, which only has 60 hours of primary battery life. When this runs out, the robot must rely on solar energy to recharge the battery systems. But instead of receiving the expected 6-7 hours of sunlight, it’s only getting around 1.5 hours of illumination during every 12-hour rotation of the comet, meaning that the mission could be over tomorrow. The ESA has therefore decided to activate a drill and hammer aboard the probe in an attempt to adjust its position into sunlight, but it could end up toppling the craft and making the situation worse. The ESA does have other options, however, such as attempting to re-fire the harpoons or moving the landing legs. If Philae doesn’t make it, the mission has still made history, and several days of data would have been collected, which is a remarkable achievement.